Flow Visualization | Dynaflow, Inc.
A 72 ft x 5 ft x 4.5 ft wind wave tank with a flapper plate type wave maker at one end. Its side walls are made of plexiglas which allow for optical access. Waves of Froude number scaled significant wave height and modal period corresponding to any of the 8 Sea States of the NATO Sea State Table. Installation of a sloping floor of adjustable angle enables generation of plunging and spilling breaking waves to simulate the sloping bottom of the surf zone. A high flow rate recirculating flow loop with Plexiglas test section for studying different flow phenomena driven by two 15 hp pumps that can be configured in serial or parallel, each pump is capable of 500gpm at 40 psi. Particle Image Velocimetry (PIV), Particle Tracking Velocimetry (PTV), and Particle counting systems with a 12 bit CCD camera with a resolution of 1392 x 1024 pixels and a dual-head Nd-YAG laser, with a maximum energy output up to 45 mJ per pulse at 532 nm. IDT Y-3 monochrome high speed video imaging system capable of frame rate from 2,000fps (1280 x 1024 pixels) to 130,000 fps (1280 x 16); the camera can be synchronized with a MiDAS data acquisition system. Redlake Motion Scope PCI high speed video imaging system with a monochrome and color cameras capable of frame rates up to 8,000 and 2,000 frames/sec, respectively; a MiDAS integrated data acquisition system with 8 analog and 6 digital input channels and a 1.25 MHz maximum sampling rate. 2 HYCAM high speed movie cameras capable of 40,000 quarter frames/sec. 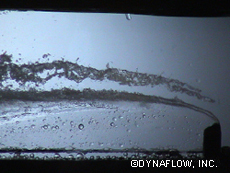 Other flow visualization equipment includes Machida borescopes and high intensity lighting source. Other digital still and video photographic equipment. Several frequency generators and digital storage oscilloscopes including a Gould 4-channel 20 MHz digital storage oscilloscope, a Tektronix 2 channel digital oscilloscope, a Tektronix 2-channel Spectrum Analyzer/digital storage oscilloscope. Other supporting data acquisition equipment, instrumentation, and sensors including different types of data acquisitions systems, flow meters, pressure gauges, sensitive hydrophones, and high frequency transducers. Plexiglas vacuum cells with electric spark discharge for explosion and cavitation bubble dynamics studies. A clean and calm Supercavity in absence of a reentrant jet formed behind a simulated projectile head.